Seriously I'm kicking myself for not trying Sibu Beauty out sooner because right now they are two for two in my book! Awhile ago I picked up a few different Sibu Beauty products, I already reviewed the mask previously and got some amazing results, I was eager to try out more products! I finally got to the point where I could justify breaking open a new scrub to throw into my rotation so I immediately picked up my Sibu Beauty Sea Buckthorn Exfoliating Scrub because I was expecting it to be just as amazing as the mask, and I wasn't disappointed. I guess let's talk details first. 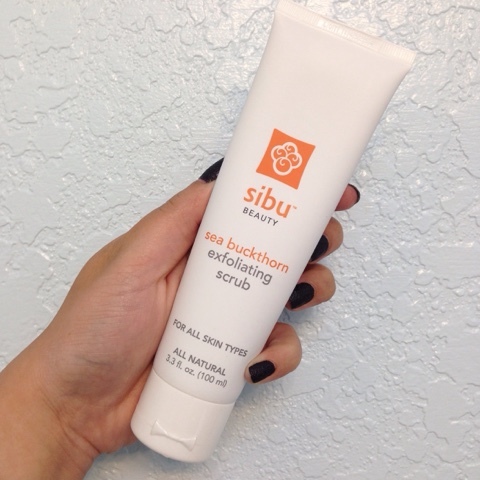 Sibu Beauty is an all natural company that uses the sea buckthorn berry in many of their products. It is a powerful fruit little fruit that is high in vitamin c and other fats that are beneficial for your skin. This scrub in particular is suitable for all skin types but it is extra beneficial to those with rough or acne-prone skin. It works hard to remove all the oils and dirt that clog up your pores leaving you with clean skin. This scrub has the signature scent that can only be described as a cross between tea and a slight splash of apricots and some other earthy scent that I can't name. Now the scrub itself, how do I describe this? It is really gritty but gentle. The scrub part of it is very abrasive and effective with larger scrubbing particulars, yet the cream cleanser it sits in is thick and moisturizing. The combination of the two gives me a deep scrub without scratching my face to reveal softer and smoother skin all over my face. The thing about this scrub is that after using it my skin is just glowing and looking really polished. On top of feeling velvet smooth my skin just looks and feels so radiant and fresh. It really does feel luxurious on your skin and it is a treat to use twice a week at night. I don't want to compare it directly to the St Ives Apricot Scrub but it's hard to escape doing that since the cleanser itself looks similar and they are both made with apricot seeds. Do not get me wrong though, they besides the appearance of these, they are two different products and the Sibu Beauty version is far superior! If you want a exfoliating scrub that delivers solid results with regards to sustainability I highly recommend you check out this scrub! My skin has never felt cleaner and the long term effects are obvious with clearer skin and pores that appear smaller because it really gets all the clogged dirt out of there! I can't wait to try out some more products from them the toner and the eye cream are next on my list for things to get my hands on!